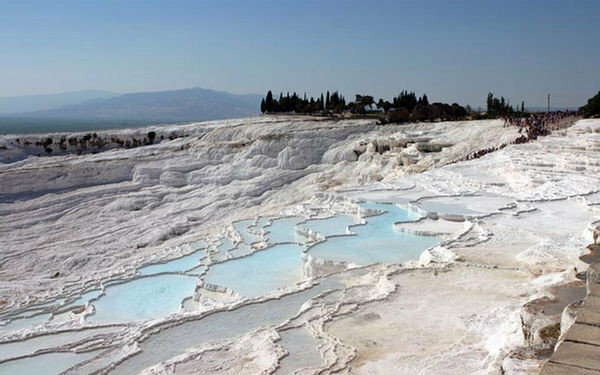 Pamukkale means Cotton Castle in Turkish – The Turkish gave the name to this place because of the amazing similarities to the white cotton plantations which have long been cultivated in the central part of modern Turkey. 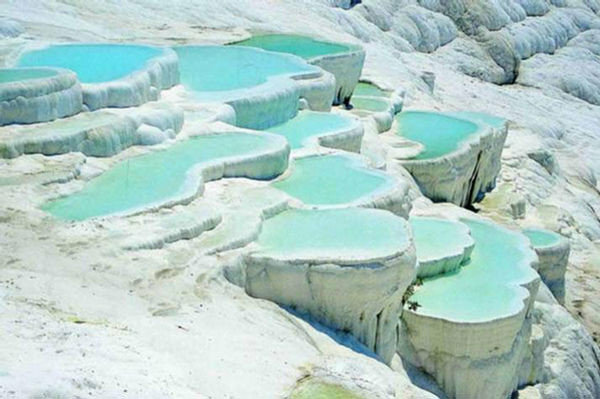 Pamukkale is located in the south central part of Aegean region of Turkey in 19 km from city of Denizli. Approximately 400,000 years ago in the heart of modern Asia Minor a series of devastating earthquakes occurred. 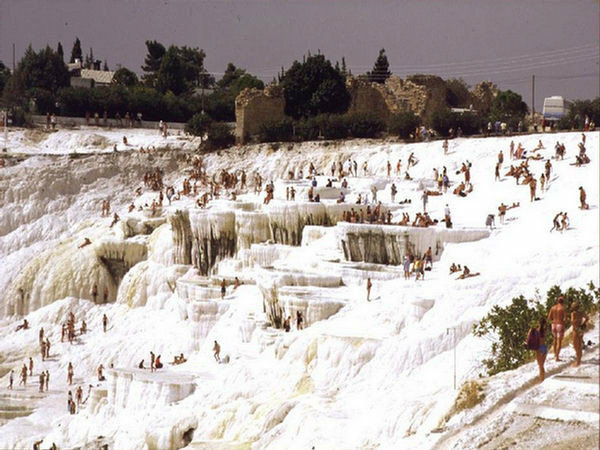 On the site of the modern Pamukkale city a strong horizontal movement of ancient rocks took a place that forced deep thermal waters to come to the surface making Pamukkale Hot Springs. 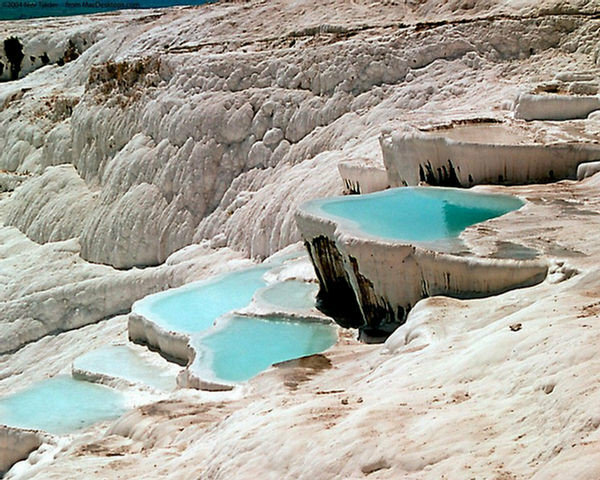 These springs which are heavily saturated in calcium started to flow down to the surface of the plateau with incredible speed (hundreds of liters per second) and then evaporated in the sun slowly forming on the surface of the mountainside over fifty meters high. 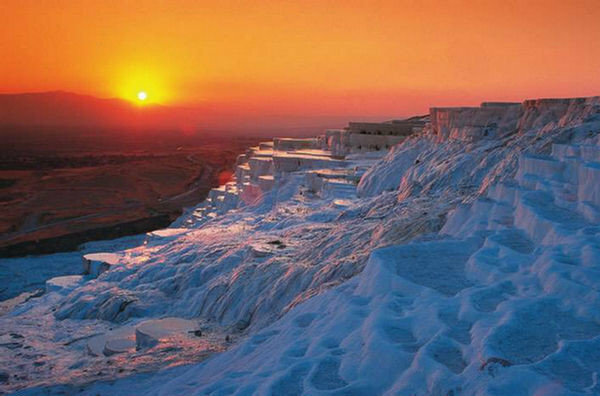 Polycrystalline fragile snow-white rock formed of calcium carbonate minerals is called travertine. 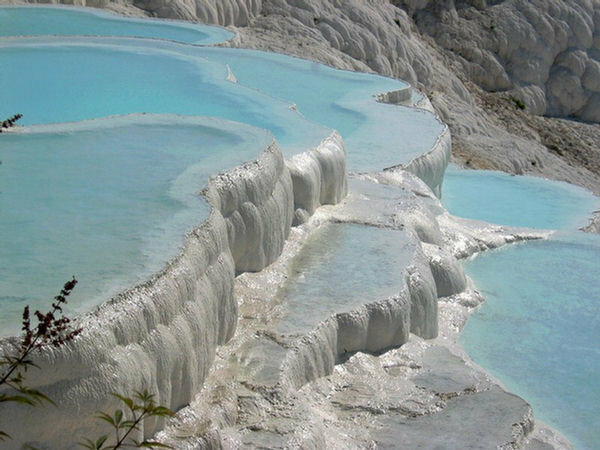 For hundreds of thousands of years nature has beautifully created from travertine a masterpiece of white fancy slopes, terraces and thermal salt pools in Pamukkale filled with turquoise water. There are many hot springs of thermal water in Pamukkale forming the Cotton Castle structure of the Pamukkale mountainside, its snow-white cap mountains stretching for as long as two kilometers. 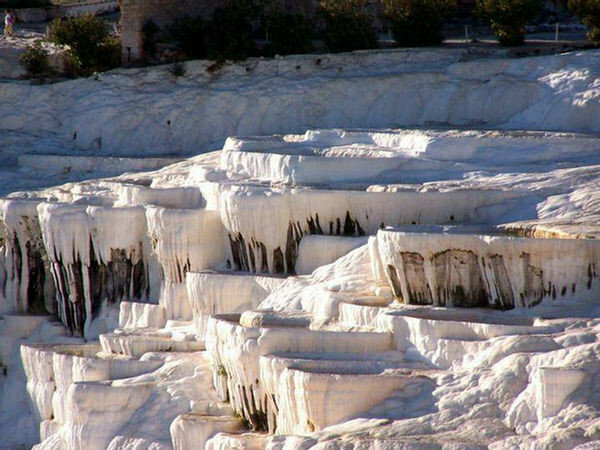 Mineral water continuously flows from the steep slope which is being used by an invisible sculptor to continuously creates magical snow-white travertine deposits. Leaving visitors wondering at the beauty and tranquility. 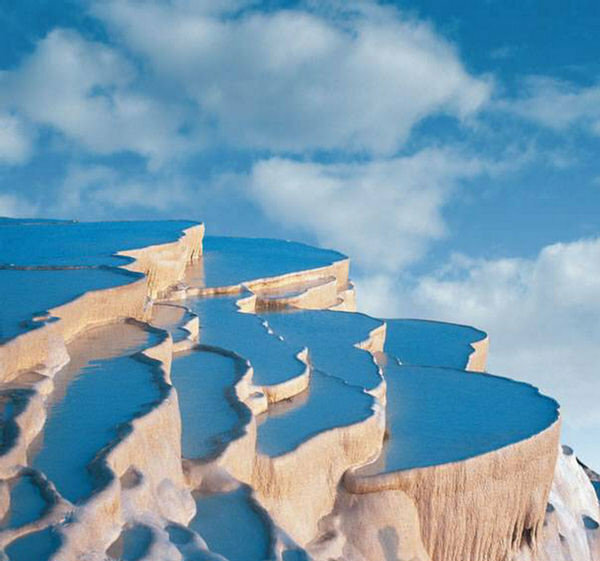 So what can you do in Pamukkale. 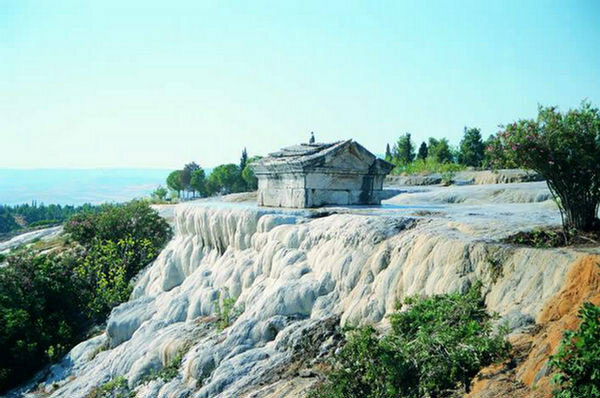 Walk along amazing snow-white Pamukkale terraces and swim in bubled soft water of thermal pool. 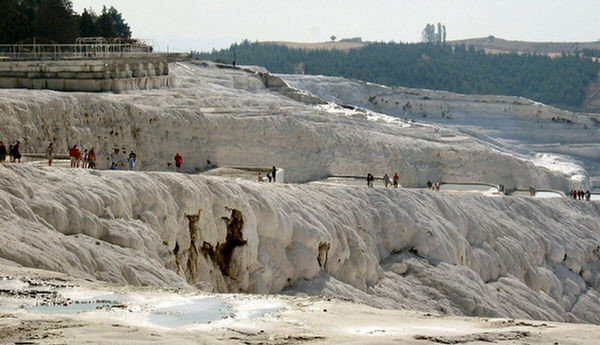 Other things to do in Pamukkale is to visit museum and ancient city of Hierapolis which is located just a short walk away and is a real highlight of Pamukkale. This is just one of the many attractions that are available in Turkey. The country is filled with exciting historical and cultural trails to satisfy every need. This entry was posted on March 22, 2016 by Martin.